The angry libtard mayor of sanctuary city Oakland, CA, supports violating federal law through the protection of criminals wanted by the federal government. 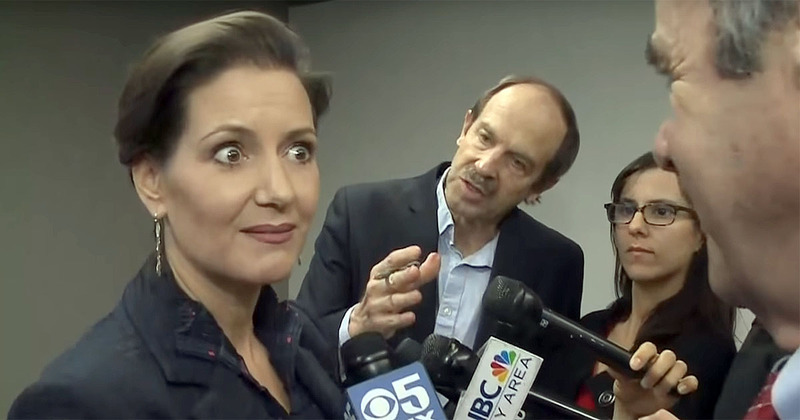 Asked what she thought of ICE raids that are expected in a California crackdown, the appropriately named mayor, Libby Schaaf, demonstrated her severe, inoperable case of liberalism by immediately attacking President Trump for enforcing the law. Libtard Libby replied, “It’s no surprise that the bully-in-chief is continuing to try to intimidate our most vulnerable residents.” Those are her city’s residents who are vulnerable because they are breaking the law by their presence and need to be removed. President Trump is merely enforcing the laws passed by Congress during a more sane time, when globalist commie Democrats weren’t holding America hostage. The angry beaver doesn’t really have an answer for that one other than her false claim that sanctuary cities are exercising their legal right to flout federal law. She says, “We are exploring whether there are actions we can take against the federal government for retaliating against” sanctuary cities. She’s asked if she feels like she’s being retaliated against, to which she replied, “That is certainly the message that has been sent.” It’s good that she’s at least capable of understanding messages, since the role of the federal government laid out in the Constitution is too complicated for her. It’s a perfect solution and the ideal home for her. Living among the other inmates, both Americans and her beloved illegals, who feel the law doesn’t apply to them is exactly where she belongs. Her new friends inside will wipe that smug arrogance off of her face and straighten out her snotty attitude in no time. If she is arrested they may want to take the added precaution of putting Schaaf in a concrete cell or under round-the-clock surveillance. She could easily gnaw through ordinary cell bars in no time with those central incisors of hers and be back out roaming the streets of her wonderful sanctuary sh**hole before anyone realized she was out. This morning[1-19-18]there were several news articles from different media sources stating that the Cali.AG announced that any employers voluntarily giving illegal alien employee info to ICE without a court order or warrant present will be charged and prosecuted for breaking Cali.sanctuary law. The entire Gov. structure of Cali. just might have bitten off more than they can chew.It would really make my day if every state,city and local gov.member was arrested and prosecuted for breaking federal immigration law. Put them and their beloved illegal aliens together in one fortified enclosure. if only they cared for American citizens as much as illegals many of these places wouldn’t such sh*tholes!!! So be it! This, too, can be arranged. Harboring a fugitive is a felony even if one didn’t know the person being hidden was a wanted felon. Ignorance of the law, and ignoring the law, is NO EXCUSE. In my world, they’re all rounded up and sent to Gitmo to await execution…Ooppps! I meant trial. if ICE is going to hold raids, then they NEED TO ADD THOSE MAYORS AND OLD MOONBEAM TO THE LIST. I wonder if she’d be willing to go to hell for them too?